Solar sunglasses. You won’t need glasses when you’re looking at your camera, but you’ll want to see the eclipse with your own eyes. Buy a reputable brand CE and ISO certifications DIRECTLY FROM THE MANUFACTURER; other solar sunglasses might block visible light, but still allow dangerous UV and infrared light through, which will damage your eyes even though you can’t see it! Some sunglasses at Amazon and other retailers are COUNTERFEIT and could damage your eyes, and there’s no way to know if they’re safe unless you buy directly from the manufacturer. Telephoto lens. If you don’t have a telephoto lens, try this inexpensive Opteka mirror lens for $120 on Amazon. Solar filter. For the cheapest results, use a solar sheet big enough to cover the front of your lens, cut it to size, and tape it to the front of your lens. For most lenses, including the Opteka, you can use this universal filter. For best results, attach a screw-on solar film filter to the front of your telephoto lens. DO NOT USE standard ND filters; those might not block infrared light that will damage your sensor or eye. Tripod. The bigger and heavier, the better! We use a Manfrotto 161MK2B and Manfrotto MVH502AH. Extra memory card (optional). Format your memory card beforehand. If your camera supports two memory cards, write to them both. Either way, carry an extra memory card with you in case one fails. Extra battery (optional). Carry an extra battery, just in case! Sunscreen (optional). You can’t see the eclipse from the shade, so be prepared to spend time in the direct sun. Sun umbrella (optional). You can’t photograph the sun from the shade; you’ll get VERY hot waiting for the eclipse. If you’re uncomfortable, you won’t have the patience to get your pictures perfect. A sun umbrella, or any umbrella, will keep you more comfortable. In the very least, wear a hat. If you don’t know how to change these settings on your camera, watch our free tutorial. The description of each video includes a table of contents so you can jump directly to the part you’re interested in. RAW (not JPG). Raw files let you recover some highlights and shadows, and you’ll need that during the totality to capture the dynamic range of the halo. View your histogram. 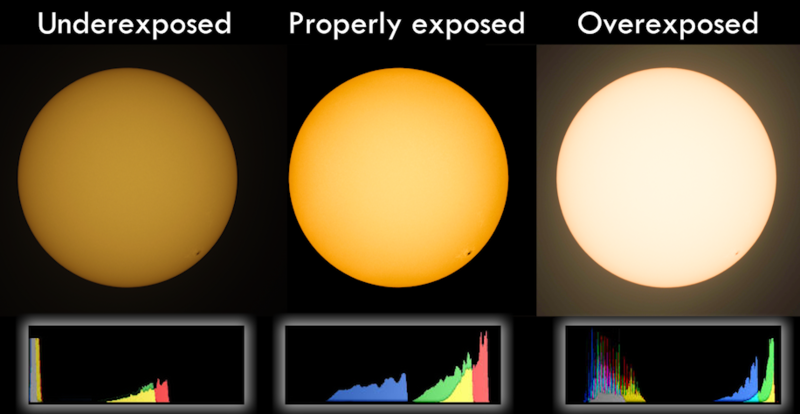 Display your histogram on your screen to prevent yourself from overexposing the sun. Manual mode. Your camera’s autoexposure won’t work reliably; you’ll need manual mode to properly expose the sun. ISO 100. Or your camera’s base ISO. Lowest f/stop (or one stop over). The exact f/stop will vary based on your lens. However, I recommend using the lowest f/stop number possible, or raising it by one stop. Raising the f/stop higher will increase diffraction and reduce sharpness. Shutter speed as needed for proper exposure. Depending on the intensity of your solar filter and the phase of the eclipse, your shutter speed might be anywhere from 1/8000 to 1/5. Check the histogram and make sure it’s peaking in the right 1/3, but not along the right side. If it peaks on the right side, choose a faster shutter speed. If the sun peaks in the middle, use a slower shutter speed. Bracketing. During the totality, you should use +-3 stop bracketing to ensure you capture the dynamic range of the sun’s corona and to help you capture the perfect exposure without any guessing. Live view. If you have an SLR, I do not recommend using the viewfinder. If the solar filter is damaged or you forget it, you might damage your eye. Delayed shutter. A 5- or 10- second delay should be enough to eliminate the shake caused by you pressing the shutter button. Weeks before the eclipse, you should practice shooting the sun on clear days. Setup your tripod, telephoto lens, solar filter, and solar sunglasses. Get comfortable examining the histogram, eliminating camera shake, and getting sharp shots. Be sure you can quickly setup bracketing–you won’t need bracketing when the eclipse isn’t happening, but you will want to quickly turn it on during the totality when you remove the solar filter from your lens. Optionally, clean your sensor so you won’t see dust in your pictures. Chapter 5 in Stunning Digital Photography has detailed instructions. Setup your tripod in the sun. You’ll probably want to fully extend the legs, because the camera will be pointed almost straight up. Attach the solar filter to the front of your telephoto lens, and attach the telephoto lens to your camera. The viewfinder will seem black unless you’re looking directly at the sun. Attach your lens to your tripod, if the lens has a tripod mount. If not, attach the camera to the tripod. Turn on the rear screen. If possible, tilt or flip the screen out. Enable the histogram. The histogram will let you verify that you have the perfect exposure. Point the camera at the sun and tighten your tripod head. Locating the sun is surprisingly hard; for best results, position yourself so that the camera is shading your eyes from the sun. Look down the barrel of your lens to align it with the sun. Focus your lens. DO NOT use “infinity focus” because it’s not precise enough. Autofocus if you can, but switch to manual focus since you won’t need to refocus throughout the eclipse. Zoom in using live view to precisely adjust focusing. Set your exposure. Manual mode, base ISO (usually ISO 100), lowest f/stop (or one stop higher). Then, adjust the shutter speed so that the sun is properly exposed. Set a 5- to 10-second delayed shutter. This will eliminate camera shake. Alternatively, use a remote trigger, or trigger your camera with Wi-Fi. Take a picture. Review the photo and verify that it is as sharp as possible. Check the histogram to make sure it’s not overexposed. Repeat steps 9-10 until the totality begins. If you experience a total eclipse where you are, temporarily remove the solar filter while it’s dark, and turn on +-3 stops bracketing. Replace the solar filter when you require a shutter speed of higher than 1/2000th. You don’t have to shoot constantly; one shot every 30 seconds or so should be plenty. In-between shots, put on your CE/ISO-certified solar sunglasses and directly view the eclipse, just for your own pleasure. If something goes wrong with your camera, don’t waste the experience trying to troubleshoot it. Just move your camera out of the sun, put on your solar sunglasses, and enjoy the eclipse. Enjoy! One may also use a video monitor instead of live view. Thus, the tripod’s legs do not need to be extended as far. This will be important if it is windy where one is observing the eclipse. My brother is coming from Virginia and I from northern Montana. We will meet together in Nebraska and take many pictures and enjoy the eclipse together. I plan to launch my P4P to catch the moon’s umbra as it crosses the landscape in the northwest direction. The P4P will have to be at max FAA elevation for any hopes to catch it. I would prefer to be at least 1500′ up the sky. Thank you for making this video available! The following link is an excellent video that describes the physics of the 2017 solar eclipse. The graphics are also excellent. Where’s link for printable checklist? Thanks guys. Good work as always, and good luck next month. Thank you for posting the histograms. I am using a Marumi DHG ND-100000 filter (16.5) stops and had the distinct impression I was either underexposing or overexposing the images. Now that I can see what I am looking for, it will be a lot easier (haha) to shoot for it. I think I gotta practice more…..
Hi Tony, I want to buy this lens you recommend (500mm f/6.3 Manual Focus Telephoto Mirror Lens 500mm + 2x Teleconverter ). Do you know were i can buy a filter safe for the solar eclipse? Tony, I just saw your video. 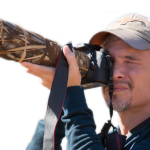 I am using a D750 with a 200-500mm f/5.6E ED VR lens. So I have a few question. 1. In the video you said that your using a Canon 2x Converter. Do you recommend that I get a Nikon 2x Converter and which one? 2. Do you recommend the Opteka 500mm / 1000mm f/6.3 Telephoto Mirror Lens for Nikon? 3. Would I need an adaptor for my lens to connect to the Opteka? Unfortunately you left out the fact that using a lens (recommended) that doesn’t communicate with the camera gives you no data for histogram (at least as tested on my canon 6D). Everything else is great info. I ran a couple of test shots the other day and found with my setup that ISO 100 and 1/10-1/20 was about right (given existing conditions). My recommendations is to setup early and run some test shots. compare those against the over/under examples and adjust. For those interested, I have a bower 500MM F8 lens (amazon) with a cut down kids cheer leader megaphone (walmart), and a 6×6 piece of solar film (between two pieces of cardboard). Goodluck to all on the day…. BTW: with a solar filter (I got mine from the Israeli military; it looks a lot lime Mylar, does a great job, $40 seems to be a fair price to see something once a lifetime..